During the different camping sessions, the OT will work with individual campers or in cabin groups. They work on functional skills that will improve the campers' independence in their activities of daily living. In speech therapy, the communication assistants and/ or interns will work with campers indivudally, in pairs, or in cabin groups. They work on target skills based on the needs of the indivudal campers as well as working on needed communication skills. Students IEP goals are reviewed when the speech therapist plans their summer camp therapy goals. In reading therapy, campers will work on their vocabulary, reading, and writing. 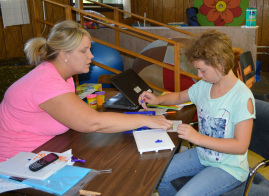 They will attend reading therapy individually, in pairs, or as cabin groups depending on the needs of the camper(s).The reading instructor reviews the camper's IEP goals when planning summer camp goals.